The Lucca outdoor furniture is a great value. The 9 pieces provide a wide variety of configurations to suit the space available. The materials seem durable and the furniture is holding up well outdoor without a cover. The pillows and cushions are firm and the fabric is not very soft. The cupholders hold smaller glasses, but are too small for larger ones. 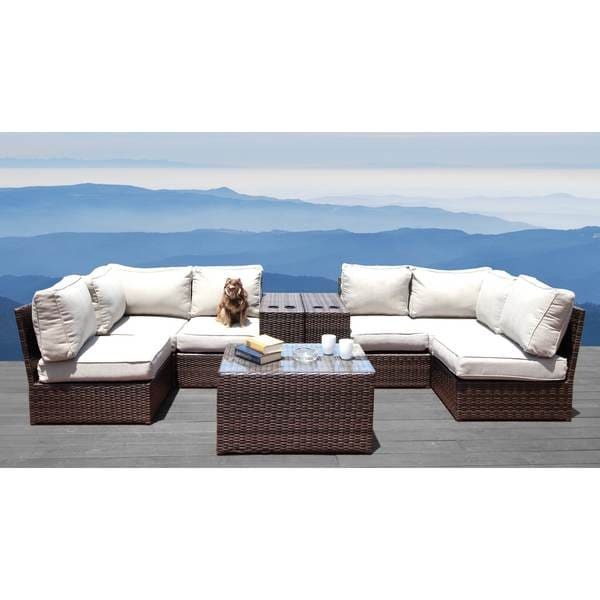 No matter how big or small your outdoor living space, the Lucca 9 piece sectional set by Living Source International provides the perfect touch for your outdoor space. With our exclusive 5" thick Ultrasoft Cushion and extra durable cup holder table, this piece comprises the perfect balance of beauty and functionality. This set also encompasses our standard oversized dimensions for increased comfort. Great as an accent piece for those with larger yards, or as the center of attention for any patio area, the Lucca Cup table sectional is incredibly versatile. This is a steal for what you get! The set is durable, well made, comfortable. The fabric is perfect and a great light gray. Looks great on the lanai! "Is this natural wicker or PVC/all weather wicker? Are the cushions water or fade, or mold resistant?" "What color is this? It says express but also says grey. Thanks. " The wicker color is espresso and the cushions are grey. "The photo shows this Lucca 9 piece sectional in ivory/tan... but description says grey. can i get this in white/ivory or tan?" The Lucca collection is made with Espresso color wicker and Grey cushions. "Can you assemble any way you want?" Yes, the pieces are modular and can be configured in multiple ways.